Here is the latest video with the Frolicaholics. We filmed it on Niijima during Guru-Guru Camp and it was such fun that I want to share the behind the scenes bits. We sat in our campsite early in morning - there were no other campers in residence yet - and tried perhaps ten takes, adjusting our position relative to the Xoom recorder. Tod's toy xylophone is a lot louder than my voice and ukulele, so he had to sit back on the bench while I cozied up to the table. 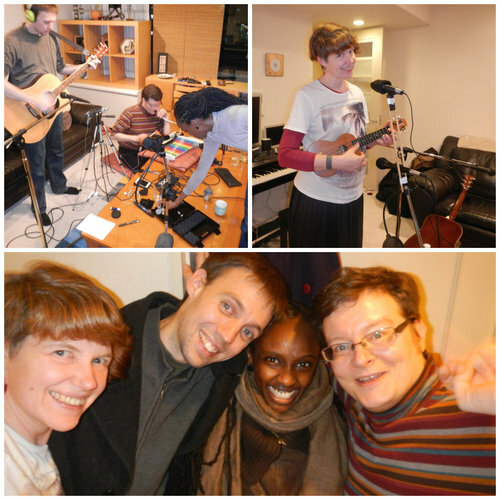 We'd brought lots of recording gear, including an extra mic and a stick-on pickup for the uke; we even considered going into town to record in the karaoke room, but...too much trouble. The sun was warm and we didn't want to move. Rob also filmed the recording session, so there are some clips from it in the video. Look for the ones where my lips sync up perfectly. We'd planned to play back the recording through my amp and sing along to it, but that was just too much work. I am pretty sure we never sang the song at the same tempo twice as we continued filming. The fact that my lips sync at all is Rob's editing magic. The birds singing in the background at the beginning are the real birds at camp. Our dawn chorus. Rob wanted to make this video to play with some new gear he's gotten since last year's camp - a very long lens and a star tracker. He'd planned to capture some of us hoopers in front of the moon, but the moon was only a crescent while we were there. So we switched to sunrise and sunset shots. Rob & I became adept at waking up before dawn to walk over to the beach. My favorite camp memory is waking at 4 and climbing up to the top the stone monument on the hill between camp and the shore. It was windy up there and a long way down. The koga stone is very grippy, fortunately, as the top of the monument is slanted like a roof. Rob got the shots he wanted of me hooping with the sun rising behind. First I sat and did poses, then when the sun was up far enough, I stood up to hoop. That waist hooping, which you'll see in the video, is rather wonky and tenuous thanks to the gusty wind and my fear of falling. I didn't topple but it seemed so likely. Pushing my boundaries was a very good experience - and it happened before morning coffee. Most of the shots of me and Tod playing our instruments were filmed at camp or in the "stone animal zoo" next door. We filmed for two days while camp was relatively empty, and then again as the flood of campers left on the last day. I think I sang Stars about 60 times. The kissing bits were taken on the other side of the island at the port ferry terminal - we sneaked up onto the balcony after the building closed to catch the sunset. So naughty. That same afternoon we also filmed on the beach and rocks near the ferry to the general entertainment of passersby. Actually, I was not feeling well that day and napped in the tent while Tod & Rob went location scouting. They called me two hours before sunset and asked me to come because they had a plan. I put on my costume, shoved our instruments, Tod's costume, and everything else we'd need into my bike basket and pedalled out of camp to a chorus of "Yabai!" from the next camp over. Hmph. The LED hooping happened on the hill in Habushiura Park one night after dinner. I love the shot of the hoops coming at the camera. Rob was great at directing motions that seemed strange at the time, then look so amazing on screen. Tod, Alice and Harusa did the trippy stuff, Sareh executed a lovely solo even though she was falling asleep, and we all did the impromptu group choreo. One evening we had a sunset hoop jam on the beach near Yu no Hama Onsen. After some freestyle hooping, we lined up for group movements and Rob got us to frame the sun, then pull our hoops away. The shot is reversed in the video so that it looks like we move into perfect alignment with the sun. Yay for editing. The mysterious dedication, "This video is for camper" is a Niijima in-joke. Our friend, Takashi Miyagawa, spends his free time making tables, benches, and other things from scrap lumber. He's even made barbecues from old gas canisters he saw sin half by hand. He brings them to camp labelled キャンプ用 FOR CAMPER. There is a huge collection of Takashi's practical furniture and we are always grateful for him and his creativity. So this video is for camper. Almost every day last week, I discussed the weather forecast with Heather. It was making unpleasant predictions for her hanami party on Sunday. It declared High: 11 - too chilly for infants to enjoy a picnic - and each day brought new doomsaying of rain with varying percentages of chance. At one point it told her it would snow and the low was going to be 1. In the end, the forecast was too wild for babies under blossoms and she cancelled the party. 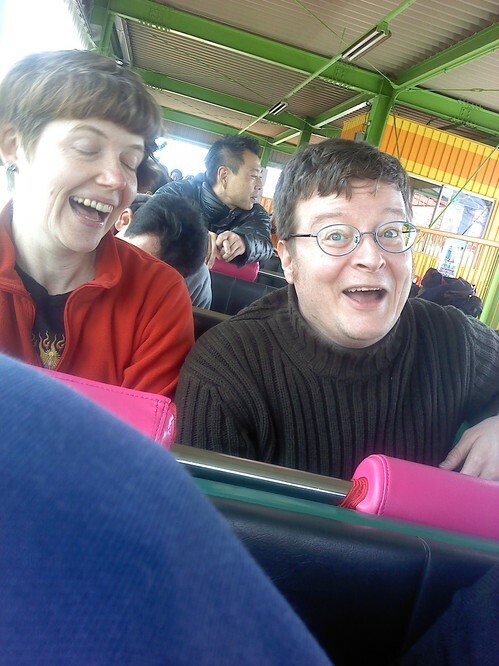 We went to visit anyway, walking through the park and riding a roller coaster, playing a private concert on the ferris wheel. Then the wind blew, clouds rolled in, and we took shelter from the HAIL and SNOW in an arcade. We played whack-a-mole and Tod bought us popcorn and found me a cotton candy machine and I made a fluffy ball of sugar that we all nibbled as we walked back through the park after the crazy storm had passed. Memorable birthday! Instead of going out to dinner or pigging out on cake, Tod & I played a show at Hoop Lounge. We were in a terrific line-up of acts that included a diablo player, a performance artist, and a Cirque du Soleil dancer/clown. Backstage was warm and chatty as we got to know one another. I performed on my birthday because I wanted to promote our upcoming Guru-guru Camp activities. We sang the song that we'll use in the video Rob is making at camp. Stars is one of my favorite Sophie Madeleine songs. I love the delicate sound of Tod's toy xylophone in this one. My horrible stage fright wasn't so horrible this time, though you will note a look of relief on my face after we finish. At least there is no terror on my face while we are playing. I am feeling more confident about making music and that helps keep the worst of the jitters at bay. Here's the video that Swinky, Jesse, and the Frolicaholics made earlier this week in our living room for The Butterfly Project. Swinky will be appearing on a popular Japanese tv show later this month and John Denver's "Country Roads," which is probably the most famous English language song in Japan, is her way of saying hello to all her new fans. Be sure to visit Butterfly Swinky to watch more Butterflies or get info on her upcoming gigs. The Zous were thrilled to stand in frame with Swinky. They think she is very beautiful. They are right and I am sure all her fans will agree. Last night, Tod & I were inducted into the Butterfly Project, Swinky's collection of casual music videos. Jesse brought a ton of equipment from their studio and while I made us some dinner, Jesse set up a six-mic-four-camera studio in our living room, including my special double mic stand kludged together with chopsticks and hoop tape. Maybe these Butterflies aren't so casual after all? It was the first time the four of us had played and sung together. There was much laughter over bad jokes and our numerous mistakes. We rehearsed for a hour or so, then ate dinner sitting in the empty places between cables. 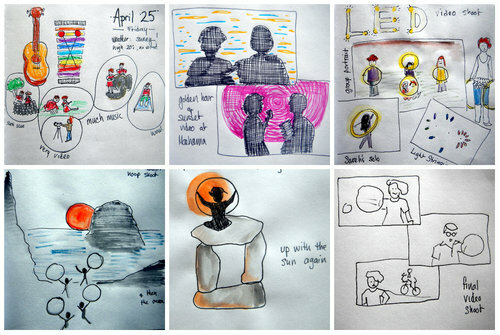 We recorded seven takes before we had something all of us agreed was good. But as Jesse checked the files and we took apart the equipment, he discovered a problem. The audio recorder failed mysteriously. There were no files at all on its card. So we scrambled to fix the device and put the studio back together before it got too late and the neighbours complained. (It was 11 pm before we finished, but nobody said anything, whew!) We did three more recordings and got a final take that included mistakes and laughter - a perfect representation of the evening. Now Jesse gets to edit all the video and audio recordings into something that looks like we just walked into the room and started playing. The video will be up on the Butterfly Project page by the end of the month. It was so much fun to do. I hope we'll get to play with Swinky and Jesse again soon. A couple of weeks back on the ukulele subReddit, there was a challenge to cover a Kraftwerk song. Electronic music on the ukulele, really? I was intrigued and Tod was interested, too, so we decided to make it a Frolciaholics project. We spent two weeks selecting a song, breaking it down into bits, learning to play it. We finished the filming and editing today. The song we covered is Radioactivity, exceptionally apropos as we near the 3rd anniversary of the nuclear disaster here in Japan. 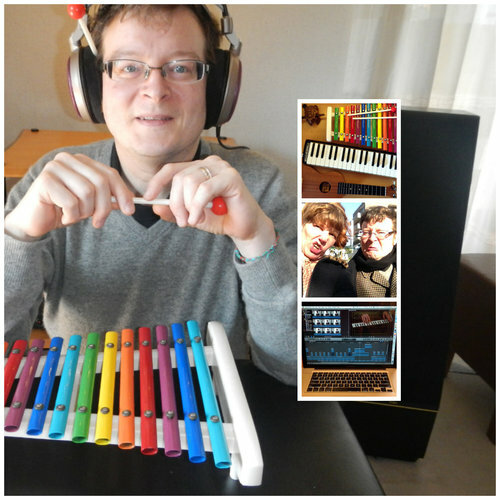 We used almost all of our instruments: ukulele, melodica, xylophone and also the stylophone, tenori-on and a wooden frog that didn't make the final cut. The tenori-on provides the bass and drums. We played the other instruments over the onslaught of 16th notes. It was a good challenge (aka almost impossible) to stay rigidly on the beat. You'll see from my grim expression that I was really focussed on getting it right! You'll hear that I didn't always mange. But I improved throughout the project and what more can a new musician ask for? Spare a thought today for the many victims of the nuclear disaster. Three years after the meltdown, very little has improved and they need your good wishes. Tod & I played a 25 minute set at What the Dickens on Saturday night. It was our first show in Tokyo. I had a happy and positive evening, despite stage fright and mistakes as I played. Here is the last song of our set. Being in a band is fun and it is scary. It is definitely worthwhile. We'll never stop learning. More stage experiences for us, please. I want to give a big hug to Huw Lloyd for inviting us to open for his band, the PopJazz Orchestra, and for joining us on stage to add a bass line to some of our songs. Thank you to What the Dickens for having us despite not knowing us. And my huge gratitude to Anna Mackie, one of my singing heros, for being warm and welcoming to us newcomers. It was a good night thanks to all of you.